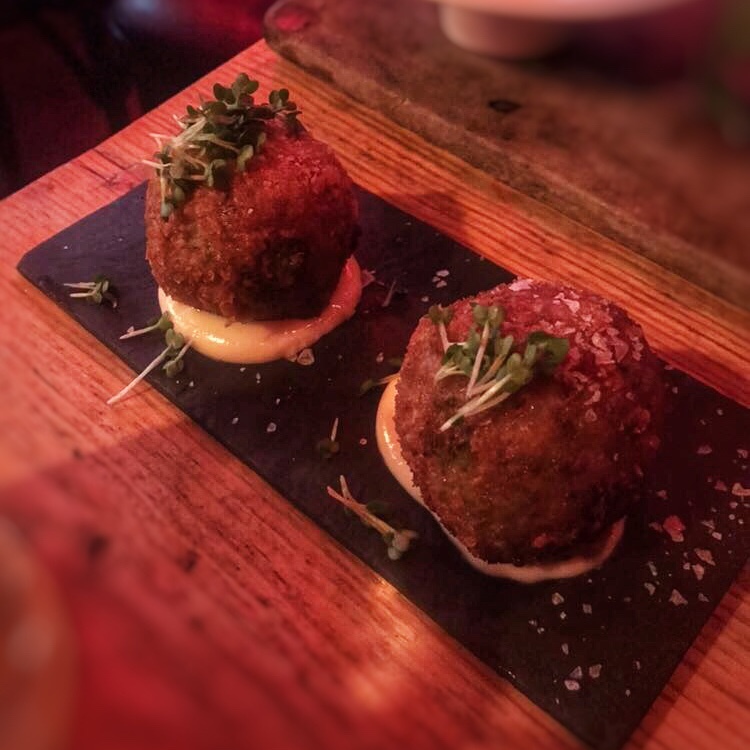 When it comes to tapas in Glasgow there’s no shortage of choice, from the always reliable Cafe Andaluz to the always delicious Iberica. I’m a fan of both so when I heard about Rioja I was unsure as to whether or not I wanted to try it but after a few recommendations and some time following their Instagram I decided to give it a go and I was not disappointed. For those not in the know Rioja is situated on Argyle Street at the Finnieston end that is home to so many good restaurants these days. There’s a really chilled out vibe to the place and the quirky interior with a wall of mirrors and all the lamps hanging from the ceiling certainly add to that. 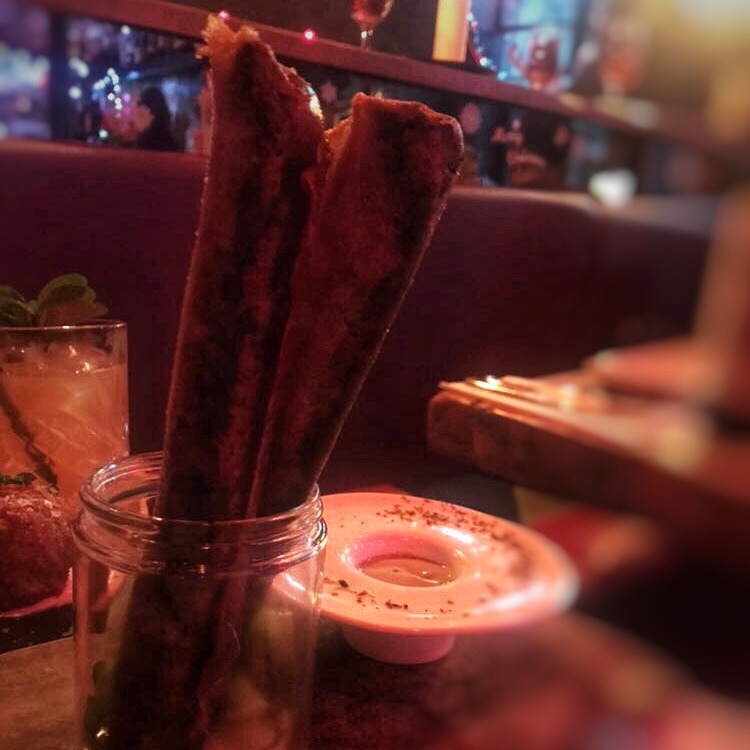 They also offer a variety of menus and have a monthly market menu that varies depending on what’s in season as well as an extensive wine and cocktail selection. Check out the menus here. The menu is split into two sections; Tapas Modernas and Tapas Clasicas. I’ll start by talking about a couple of classics because when it comes to tapas I’m pretty much always going to order the chorizo and the prawns! First up then is the Chorizo a la Sidra; which as the name suggests was chorizo in cider and for a dish that is as simple as it comes it was also delicious. 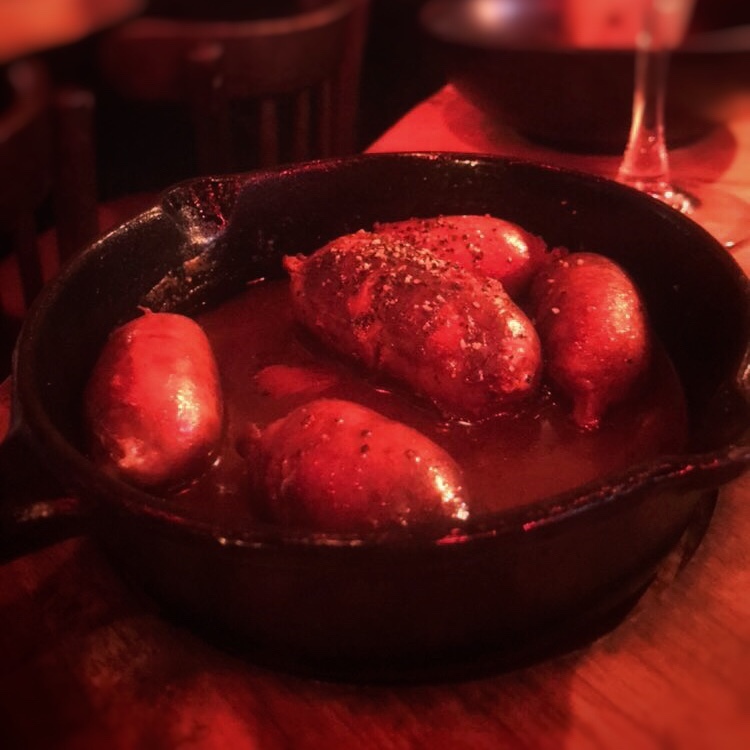 There’s not much else to say about this dish, if you like chorizo then you’ll love this and the cider gives it something different from the usual red wine or oil it’s served in elsewhere. 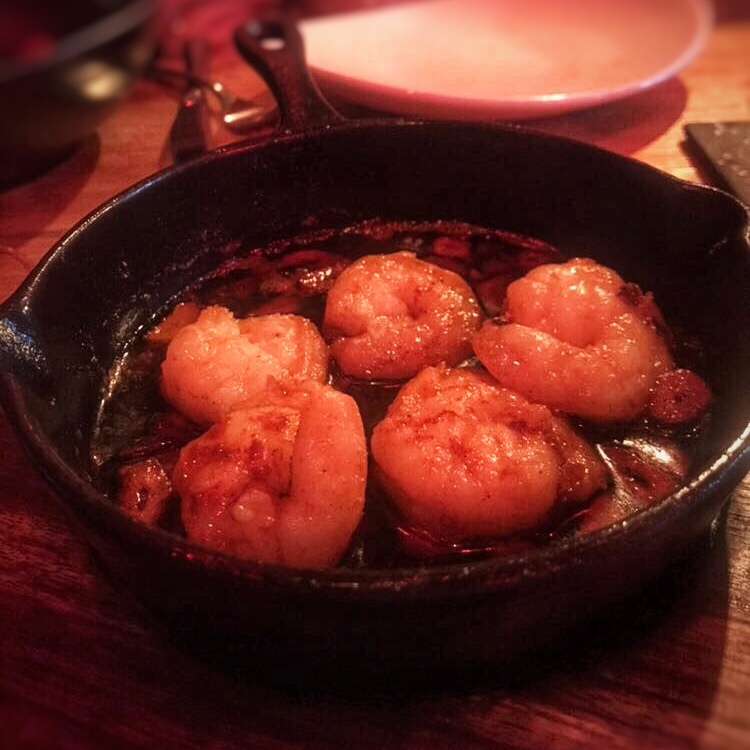 Next we have the Gambas al Ajillo; king prawns served in oil with garlic and chilli and a staple of any tapas place I’ve ever set foot in. Again this was a simple yet delicious dish, the prawns were fresh and cooked perfectly and the charred garlic and chilli in the oil gave them a nice kick and flavour. This just goes to prove my point that nothing bad is ever served in a skillet! 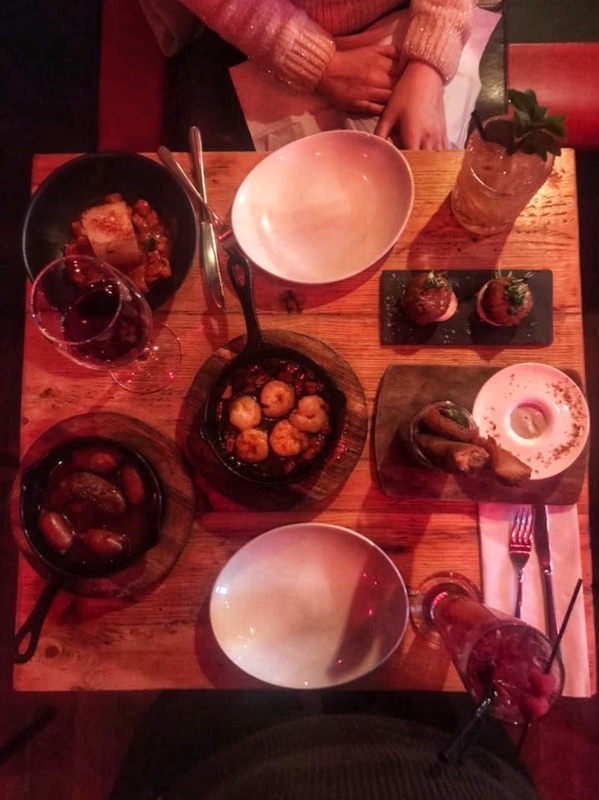 After having a few old ‘Clasicas’ we decided to branch out to the Tapas Modernas section of the menu and see just what Rioja had to set it apart from the competition. 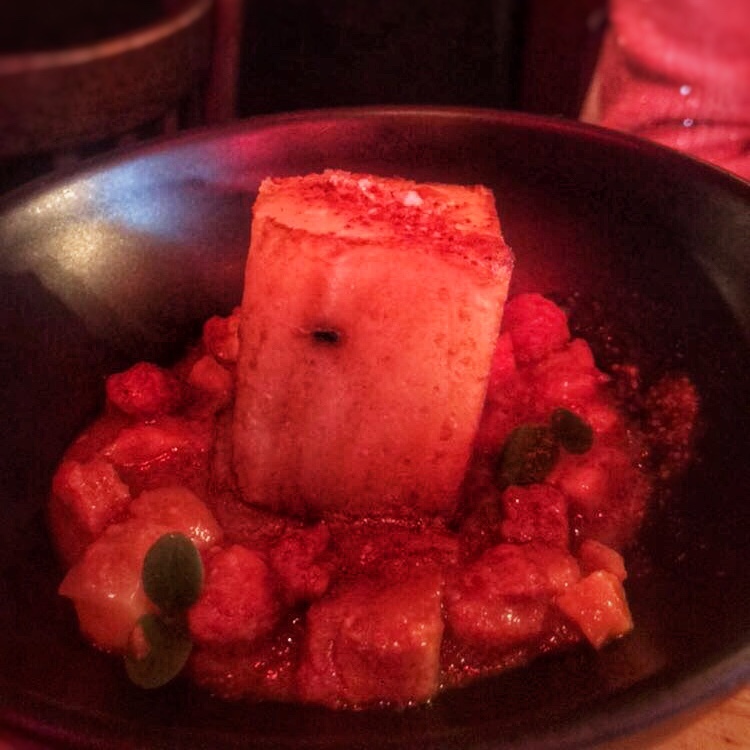 The first pic above here is the Patata Riojana; potato stuffed with chorizo and pork belly, what’s not to love? In all honesty the dish wasn’t as good as I hoped, it was good but didn’t have the wow factor I was hoping for considering chorizo and pork belly are a few of my favourite things. It was still thoroughly enjoyable though. Secondly here we have the Crujiente de Morcilla; crispy parcels with black pudding and apple. This dish was a step up from the last, the parcels were light and flaky and allowed the black pudding flavour to come through. I really enjoyed this dish, unsurprisingly giving my love for black pudding being up there with chorizo and pork belly. My only criticism of this dish was the dip served with it wasn’t my favourite and had a very strong blue cheese flavour to it. I didn’t think it complimented the parcels well but then I also didn’t think any dip was necessary. All in all though it was a winner for me! Sticking with the Modernas menu these next 2 dishes were two of my favourites and would definitely recommend them to anyone visiting Rioja. If I’m honest I’d be hard pushed to pick my favourite between the Carrillera Iberica and the Cordera a Baja Temperatura but I’ll give it a shot and say the former. 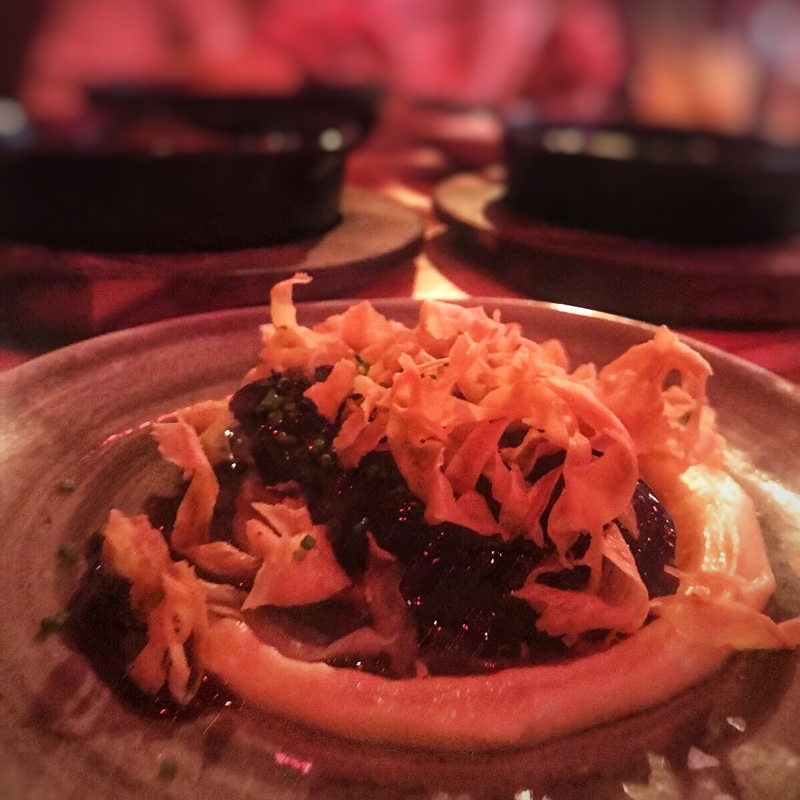 The Carillera Iberica (pictured first) is Iberian pig cheek on a bed of parsnip mash topped with something I wasn’t sure what it was but was damn tasty. 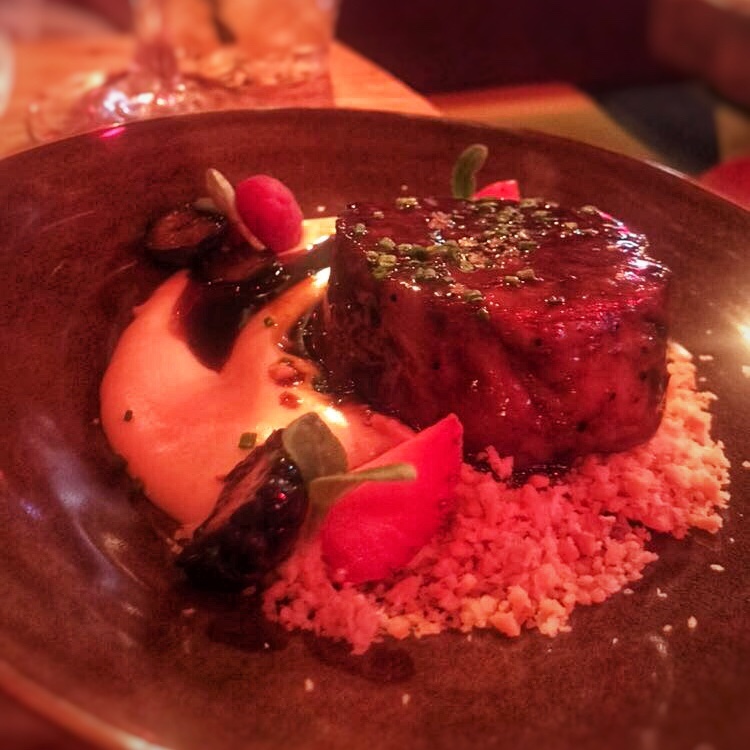 The pig cheek was amazing, it was so tender that it fell apart without even the need for a knife and melted in the mouth. The parsnip mash was a perfect compliment to it and the dish, like all of them, was beautifully presented! Next up was the Cordera a Baja Temperatura; slow cooked leg of Spring lamb, almond crumb and mashed potato. This was a quirky dish to say the least, I wasn’t sure about the fruit on the plate as I don’t feel it added to the dish but the rest was pretty spectacular. The lamb, like the pig cheek, just fell away without a knife and melted in the mouth and the mash potato was great. I’ve never had almond crumb before but it was a great little addition to the dish and added another texture which added to the dish. Last but by no means least was the pièce de résistance as far as I’m concerned, even though it may have been the most simple dish of the lot. The Cromesquis; croquettes of Gruyere cheese and spinach were simply fantastic. Packed with flavour and oozing with cheese it was near perfect. If you go to Rioja and don’t order this then you are missing out! I’m not 100% sure what the croquettes were resting on but it was one of the most delicious sauces/aioli’s I’ve ever had the pleasure of tasting! I honestly can’t recommend this dish enough! As if all that food wasn’t enough, that’s 7 tapas and counting for those not, we decided that no end of year dinner is complete without dessert and drinks. 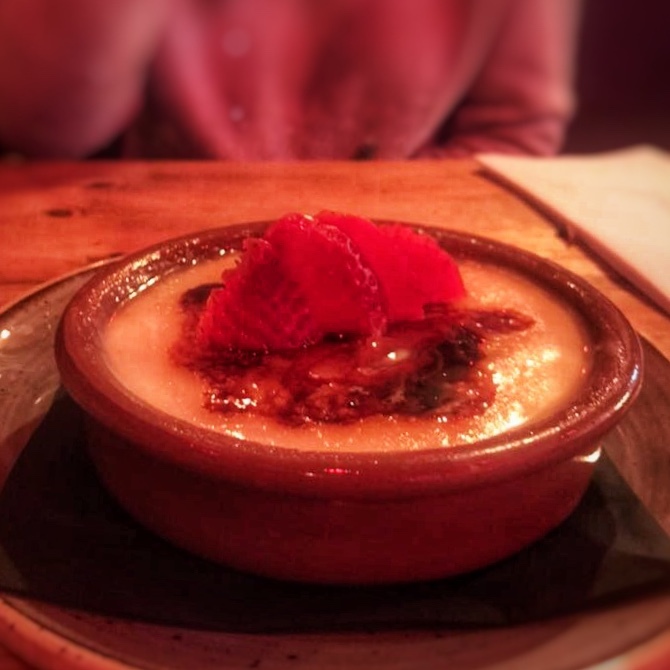 That said we could only muster the energy to share one dessert between us so we opted for the Crema Catalana which is a traditional Spanish dessert that is similar to a crème brûlée. The custard was actually quite light which was ideal after the mountain of food already consumed and it was the just the right amount of sweet to cap off a terrific meal! A special mention now for the drinks as every great meal needs great drinks to compliment it. We got a delicious bottle of red (not pictured) that was nice and fruity and the perfect accompaniment for the horde of dishes we enjoyed. Regular readers may know of my love of beer but for this meal I went a bit off-piste and went for a cocktail instead. I had 2 tremendous rum based cocktails that I’d highly recommend. 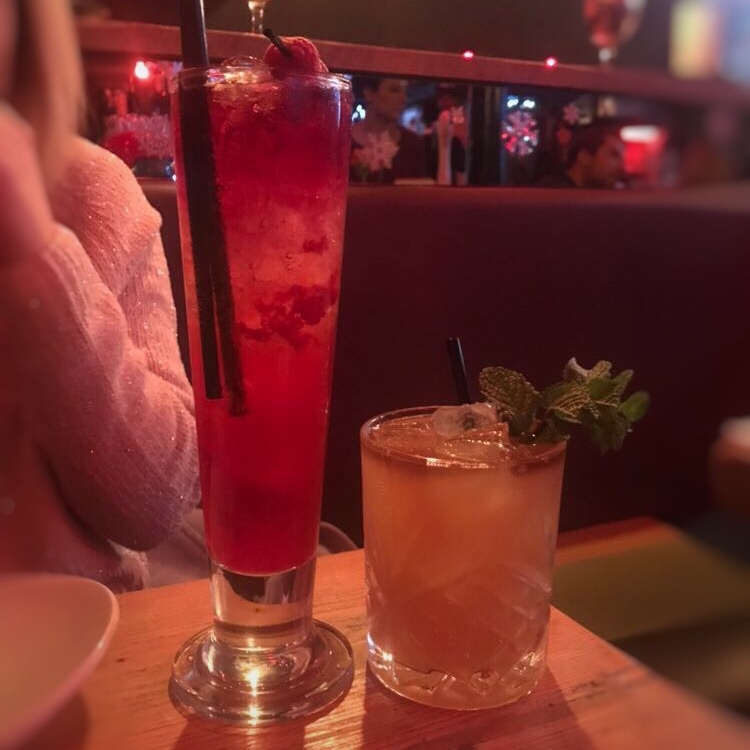 The tall red one, The Port in a Storm, was an interesting take on a Dark and Stormy and combined Sailor Jerry Spiced rum with Brugal Blanco, Raspberry and Ginger Beer. This was fruity and refreshing and a bit different from my normal tipple but I enjoyed it immensely. The second drink, the shorter and lighter El Pulpo Loco was a bit more up my street and combined one of my favourite rums, Kraken Dark Spiced with Apple and Disaronno. This was delicious and I could see myself drinking these on a regular basis from now on! Having been to quite a few tapas places in Glasgow I’d definitely rank Rioja as my favourite. The food was delicious and the menu had some great choices I didn’t get to try so another visit is a must! The place had a great vibe and I could see myself popping in to share a bottle of wine or a few cocktails and still having a great night at Rioja!